The 1 troy ounce Canadian Silver Maple Leaf is a world famous Canadian silver bullion coin produced by the Royal Canadian Mint (RCM). Since it’s launch in 1986, the Silver Maple Leaf has become one of the world’s most popular silver bullion coins. 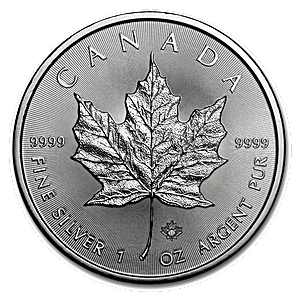 Each 1 oz Canadian Silver Maple Leaf investment coin has a diameter of 38 mm, and a width of 3.29 mm, and is produced from 99.99 % pure silver. In fact, the Silver Maple Leaf was the world’s first ever silver coin to be issued with this 99.99 % silver purity content. 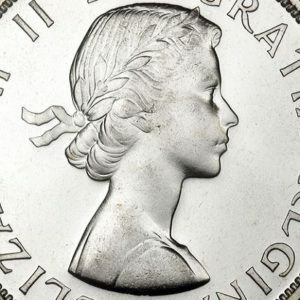 The obverse on the coin features a modern portrait of Queen Eizabeth II by Susanna Blunt, with the words ‘ELIZABETH II’ encircling the portrait above, and the coin’s legal tender face value ‘5 Dollars’ and year of manufacture in an arc below. The coin’s reverse features an iconic high relief representation of Canada’s national emblem, the Maple Leaf, with the silver purity 9999, and weight “FINE SILVER 1 OZ ARGENT PUR” displayed in an arc below. Since 2014, Canadian Silver Maple Leafs feature ingenious security features in the form of precision machined radial lines on both faces of the coin emanating from the centre, as well as a micro-engraved textured maple leaf detailing the year of manufacture. The Silver Maple privy mark is micro-engraved with the number '16' corresponding to the year of this coin. The amazing worldwide popularity of the Silver Maple Leaf ensures that the market for these coins is always highly liquid. Individual coins are delivered in coin flips, orders in increments of 25 Silver Maple Leaf coins are delivered in RCM mint tubes, while orders of 500 coins are shipped in the RCM's famous monster boxes of 25 tubes per box.